What About Subsequent Events—Lessons from the Valuation of Artwork? In the December 2015 Tax Court Memo Estate of Newberger v. Commissioner, the Tax Court considered post-date-of-death sales prices in the valuation of three separate pieces of artwork owned by the decedent. Considered in one instance was the sale of the actual piece of art itself, and in two other instances, the sale of other pieces of art considered comparable to the art owned by the decedent. Also at issue was how the Great Recession impacts value in the context of reliance on actual or comparable sales transactions. Although this case deals with artwork, the same principles apply to business/securities valuations when a post-valuation date sale occurs. It also calls into question the market data on which appraisers rely—must we look past the valuation date for this data too? This is not the first case in which the Tax Court has considered a subsequent sale when determining fair market value. As such, estate planning professionals, attorneys, and valuation experts should take note. In valuations performed for estate and gift tax purposes, valuation professionals rely on certain guidance, including Revenue Ruling 59-60 (“59-60”), professional standards issued by the various appraisal organizations, generally accepted business valuation practices, and case law. Fair market value is defined in 59-60 as the price at which the property would change hands between a willing buyer and a willing seller, when the former is not under any compulsion to buy and the latter is not under any compulsion to sell, both parties having reasonable knowledge of relevant facts. If both buyer and seller are assumed to possess reasonable knowledge of relevant facts, there must be a cut-off date for which relevant facts would be considered by both when determining value. This is true because the majority of valuations are performed retrospective to the valuation date, which could leave for a broad interpretation of what information should be considered absent some widely accepted standard. In general, appraisers have looked to the ‘known or knowable’ principle to determine what information to consider; that is, if the information was known or knowable as of the valuation date, it is considered in the valuation. While the use of subsequent events is not a recognized practice in business valuation, one narrow exception has emerged from tax court case law. These cases have differentiated between subsequent events that affect value as contrasted with those that provide evidence of value. Those that provide evidence of value may require the appraiser to reconcile the subsequent event with their opinion of value at the effective date of the appraisal. In the case of Newberger, the Tax Court found that subsequent sales, of both the decedent’s artwork and artwork deemed comparable to the decedent’s artwork, provided evidence of value, and, thus, must be considered. Bernice Newberger died on July 28, 2009 owning, among other assets, three valuable paintings. They were (1) Téte de Femme (Jacqueline) by Pablo Picasso (the “Picasso”), (2) Untitled by Robert Motherwell (the “Motherwell”), and (3) Elément Bleu XV by Jean Dubuffet (the “Dubuffet”). There were two primary issues in this case—the timing of the decedent’s death just one month after the Great Recession was officially declared to be over, and the impact of post-date-of-death sales on value. The Picasso was created in 1963 and acquired by Newberger in 1981 for $195,000. On February 2, 2010, six months after the valuation date, Christie’s London sold the painting at auction for $12.9 million, which comprised a purchase price of $11.5 million plus commission paid by the buyer of $1.4 million. 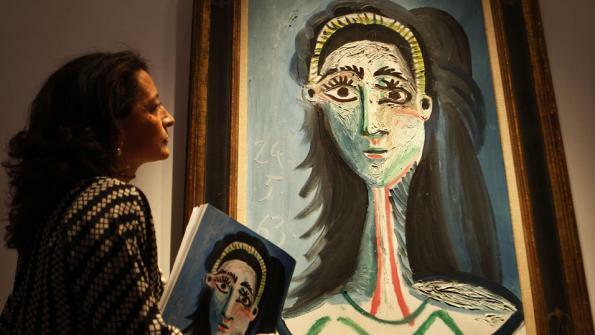 In its 706 filing, the Estate valued the painting at $5 million based on its agreement with Christie’s to sell the Picasso for a minimum of $4.8 million plus 60% of the “hammer price” above that amount, concluding that the actual selling price was a “fluke.” The IRS issued a notice of deficiency that claimed a value of $13 million, but later at trial reduced the amount to $10 million. As such, the Court found for the IRS at $10 million. The Motherwell painting was created in 1966 and acquired by Newberger in 1969 for $8,000. In 2010, a work deemed similar in size, composition, and date of creation—Motherwell’s In Black and White No. 5—sold for $1.43 million. Relying on this sale, the Estate’s experts valued Newberger’s painting at $450,000. The IRS determined a value higher than the comparable sale at $1.5 million and, at trial, the Estate (smartly) increased its value determination to $800,000. The Court called the IRS’s expert’s value “inexplicable” and found that, in relying on a sale from 2010, she erred in not making the same market adjustments she made for the Picasso to account for the change in economic conditions. The Court found for the Estate at $800,000. The Dubuffet is a larger piece acquired by Newberger in 1982 for $40,000. The closest comparable sale was in November of 2007, when a similar sized work from the same series sold for $825,000. Relying on this pre-Great Recession sale price, the Estate valued the piece at $500,000. The IRS relied on the same comparable sale to determine a value of $750,000 in its notice of deficiency, which it increased to $900,000 at trial. It is clear from this case, and others, that the Tax Court expects at least some consideration of actual sales subsequent to the valuation date. The Newberger case is not the first time the Tax Court has considered post-valuation date sales. In The Ringgold Telephone Company v. Commissioner, an S corporation conversion case, the Tax Court weighted equally the sale price of the interest with the value conclusion determined by the taxpayer’s expert. In that case, the Court said the sale was probative, but not conclusive, evidence of the value of the interest on the valuation date. The Court also noted that the sale was within six months of the valuation date, was at arm’s length, and there were no intervening events that would have affected value. With respect to post-valuation date comparable sales transactions, this may be more of an art-related phenomenon, where comparable sales transactions can be difficult to come by. It is rare in business valuation to rely on transaction data that is subsequent to the valuation date, particularly if a sufficient number of transactions occurring prior to the valuation date are found. From this case, it seems the appraiser cannot blindly rely on the ‘known or knowable’ concept in the context of estate and gift tax valuations. Subsequent sales must at least be considered, with proper adjustments made for varying economic and operating conditions. One question that will surely arise from this case is: how far past the valuation date will the IRS reach? In both Newberger and Ringgold, the sales occurred within six months, inside the nine-month filing deadline for estate and gift tax matters. Estate of Bernice Newberger et al., v. Commissioner, Tax Court Memorandum 2015-246. Filed December 22, 2015. Estate of Mildred Herschede Jung 101, T C 412; 1993 U.S. Tax Court; Estate of Scanlan v. Commissioner, T.C. Memo. 1996-331 (4/24/96) and reconsideration denied in T.C. Memo. 1996-414 (1996). Estate of Bernice Newberger et al., v. Commissioner, T.C. Memo. 2015-246. Filed December 22, 2015. Heidi P. Walker, CPA, ABV, ASA is a Managing Director in the Portland, Maine office of Meyers, Harrison & Pia Valuation and Litigation Support, LLC. She has performed numerous valuations of business interests for both litigation and non-litigation purposes, including matrimonial dissolutions, shareholder disputes, estate and gift tax planning and filing, employee stock ownership plans, business damages, buy-sell agreements, mergers and acquisitions, and breach of contract. She has significant experience as a jointly-retained financial expert in litigation. Ms. Walker can be contacted at (207) 775-5111 or by e-mail to hwalker@mhpbv.com.